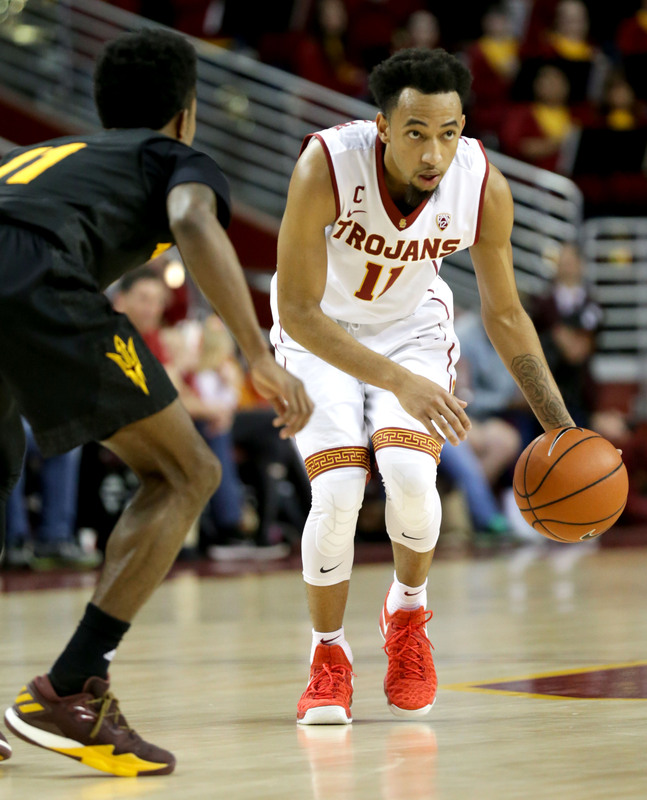 Heads up · Junior guard Jordan McLaughlin looks to captain the Trojans to victory against Washington on Saturday to wrap up the regular season. Two weeks ago, the men’s basketball team may have looked forward to Saturday’s matchup against Washington, hoping to use the game to build momentum heading into the postseason. With the Trojans stumbling to the finish line, however, their date with the Huskies is no longer an opportunity, but a mandatory assignment. Once a foregone conclusion, USC’s spot in the NCAA tournament is now in jeopardy. ESPN bracketologist Joe Lunardi released his latest projections on Thursday, listing the Trojans as one of the last four teams into March Madness. The tipping point came last weekend, when USC squandered a double-digit lead to lose at Arizona State. 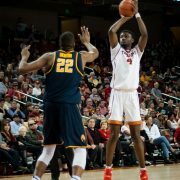 The Trojans may need the victory over Washington — possibly more at the Pac-12 tournament next week — to secure a berth in the Big Dance. Shelby Mast, who runs the website Bracket W.A.G. and works as USA Today’s bracketologist, weighed in on the Trojans postseason prospects. Missing out on March Madness would spell disaster for head coach Andy Enfield and his squad. The program has made impressive strides since his arrival in 2013, making it into the tourney for the first time in his tenure last year. USC came into this season hoping to build on its first-round exit versus Providence in 2016, but it may not get the opportunity to do so if it fails to execute against Washington. But amid the noise surrounding the team’s postseason prospects, the Trojans are keeping their heads down. 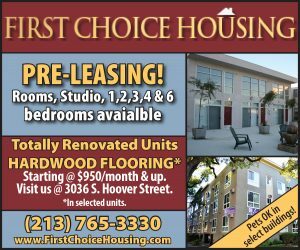 USC may have caught a break, too, as the Huskies’ projected first-round NBA draft pick, freshman guard Markelle Fultz, is expected to miss Saturday’s game with a knee injury. Fultz led his team with 20 points and six assists against the Trojans when they visited Seattle last month, and Washington (2-15 in Pac-12 play) faces a tall challenge without its star. 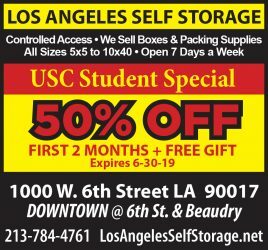 The team is already in the midst of an ugly 11-game losing streak, which USC will look to extend this weekend. 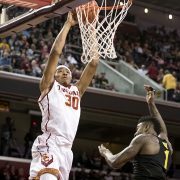 With the Trojans on the bubble for the NCAA tournament (and unlikely to earn an automatic bid by winning the Pac-12 championship), their postseason fate will ultimately be determined by the selection committee, and Enfield appealed to USC’s strength of schedule heading into the regular season’s final weekend. A strong victory over Washington would further strengthen the Trojans’ resume — and Enfield hopes his team can also add a few more wins next week in Las Vegas. What are you talkin’ about Ollie? Agree If the Trojans would lose at home to UW playing w/o their star player USC doesn’t deserve an invite. Come on now, beating a better WSU team by 23 the other night think the Trojans could lose legit to this bottom feeder. Other forecasters have the Trojans anywhere from 7 to 9 seed so your article has no merit, and is just filling space.